There is no single recipe about mapo tofu! Let it cook for a little bit, about 20 seconds, toss in the Sichuan peppercorn and garlic. Before the tragedy happens, let's add the spicy bean paste, chili sauce, and soy sauce. Give it a quick stir then toss in the meat. 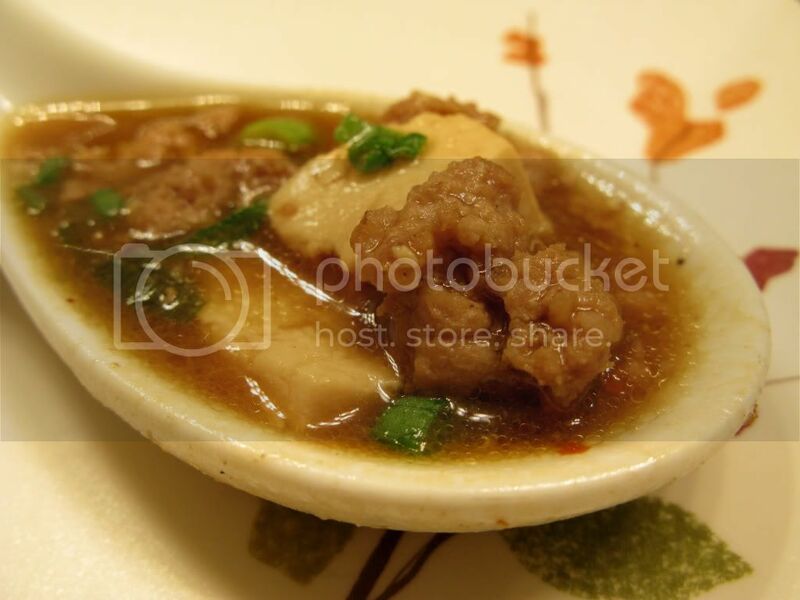 Stir it once a while and let it cook till at least 2/3 of the sauce is absorbed by the pork. Kind of fun to break them apart with my spatula! Add hot water till all the ingredients are submerged under the liquid. Bring to a boil then turn to medium/low heat. Have a small bowl ready, pour some corn starch in it. Add some water, I only added about 3 tablespoons of water for lots of corn starch. Mix it well so no lumps are present. If you get lazy and stop stirring, you gonna get mapo tofu lumps for dinner! 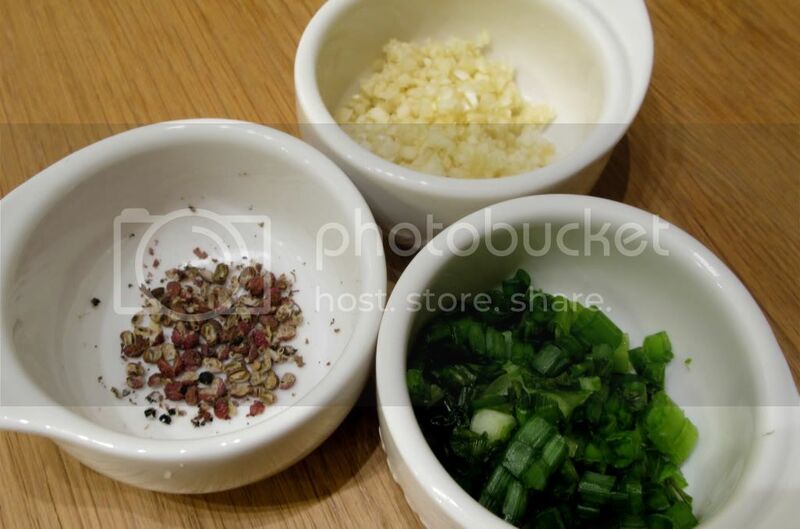 Sprinkle some black pepper and chopped scallion before serving. Some people also add some sesame oil, I'm not a big fan of that though. My all time fav! YesSSSS! This is one of my favorite dishes, too! Yummy!! Yeah, it's good with almost everything! Rice and ramen especially! Love it! I even made it "organic version." Almost all the ingredients are organic! Off tofu for two months? Well, I'll eat up lots of tofu for you here during these two months! Just made this! I had to substitute some stuff (didn't have szechaun pepper), but it came out awesome! I'm so happy that you like the recipe!! Where did you get the szechaun pepper? I went to the irvine 99 but they didn't have it, or rather, I couldn't find it. I asked an employee but he didn't know either (hua jiao?). It should be around the spice aisle. if not, I'm sure you can find it at Mistuwa in Costa Mesa. It's in a clear plastic package! Let me know if you still can't find it! Black seeds? You mean the peppercorn?? Or?? Yeah, the sichaun pepper corn. The little black....thingies lol. I'm not sure what to call it. Ok yeah just looked it up. Thank goodness for wiki. So yeah, exactly what that paragraph says, those black peppercorns I guess. I've seen them floating around whole in sichuan restaurants. My problem is I couldn't get them to separate nicely like in that picture, and if I ground everything, the peppercorns have a sandy texture in the food. So I'm wondering what you do. Thanks for the fast response btw! During the first few steps, I drizzle some oil in the pan, add in the garlic and scallion right? You can add the peppercorn at the same time too, just cook till the aroma comes out and before the garlic gets burned. I never taste the sandy texture in my mapo tofu tho, unless I didn't grind it well, I think the initial cooking step helps in "breaking" down the peppercorn so you won't really have that sandy texture in the final dish. PS. Or you can skip the peppercorn but you won't really get that tinkling feeling later on. Just substitute it with chili oil, it adds some flavor too! Hmm alright I'll try that! I want to keep them cuz I love the unique flavor it has. I actually double or triple the amount you call for haha. I'm already starting to salivate thinking about this.